As with other large metropolitan areas in the United States, there is a large concentration of business Internet providers in Washington, DC. At least 30 business Internet providers in Washington, DC, compete for the lucrative market consisting of home offices, small and medium size businesses, large enterprises, government departments and educational institutions. All forms of business Internet access are offered in Washington, DC, and they include mobile access, fixed wireless access, satellite access and wireline access – the focus of this page. The business Internet providers featured here do not necessarily offer service in every corner of Washington, DC. While most of them are available in downtown DC in the North West of the city, underserved areas such as Anacostia have a few providers. For a list of services and packages available at your address, consult GeoQuote. Wireline business Internet services available to small and medium sized businesses in Washington, DC, include Internet T1, business DSL, business cable and Ethernet over optical fiber or cable. 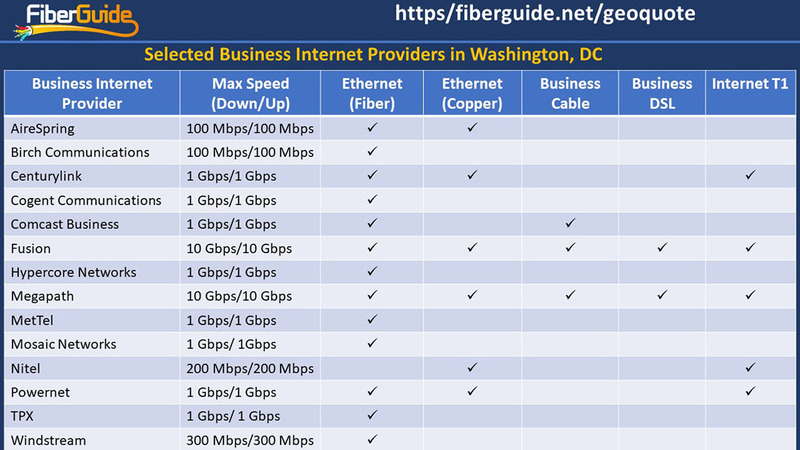 Business Internet providers in Washington, DC, may also offer wavelength services and point to point connectivity over leased dark fiber to large enterprises requiring either high scalable bandwidth and/or tighter security. Wireline Internet solutions offered by business Internet providers in Washington, DC. Internet T1 – T1 lines based on Time Division Multiplexing (TDM) have been around since the 1960s. Although their pricing has remained relatively high (~$200 for 1.5Mbps) in competitive markets, they remain hugely popular. For some businesses it could be their only form of dedicated Internet service with guaranteed bandwidth and Quality of Service (QoS). Because T1 services are transmitted over twisted copper pair, almost every premise with a fixed line can be provisioned with the service. Business Cable – Cable or Hybrid Fiber Coaxial (HFC) is readily available in most premises in the United States. Cable broadband is one of the most ubiquitous Internet service available in the USA. Business Internet providers in Washington, DC, bundle cable broadband with other services such as hosting, emails and IP addresses. Business cable may or may not come with dedicated bandwidth and QoS. The onus is with the subscriber to find out from the provider or to make a query through GeoQuote to determine if these guarantees are available. Cable Internet is typically configured as asymmetric with much lower upload speed than download speed. This could be problematic if your objective to be connected to the cloud where data is frequently uploaded. Unfortunately, business cable Internet providers may only advertise their business cable download speed and not the upload speed. Check with your provider or FiberGuide through GeoQuote to find out the upload speed of a provider you are interested in. Business DSL – As with Internet T1, Digital Subscriber Line (DSL) is provisioned over your phone line. Most homes or businesses with a copper phone line can be provisioned with DSL service. DSL may or may not come with guaranteed speed and QoS and again, the onus is on the subscriber to ensure that QoS can be guaranteed if needed. In many cases, DSL is also offered as an asymmetric service or ADSL although modern variants such as ADSL2+ are symmetric. Ethernet – Business Internet providers in Washington, DC, who offer Ethernet access typically provision it over twisted pair copper or optical fiber. With very low cost/bit, Ethernet is increasingly becoming the service of choice for business Internet access and other Wide Area Networking (WAN) applications. Moreover, Ethernet can come with guaranteed bandwidth and QoS. Most enterprises now use Ethernet to replace TDM services such as T1 and SONET in their WAN networks. The only caveat is that Ethernet services are not as readily available as T1s and cable and significant upfront costs may be incurred to connect a building to the nearest Ethernet point of presence. Use GeoQuote to find out if there is already Ethernet service in your building or the nearest point of presence to connect your building.